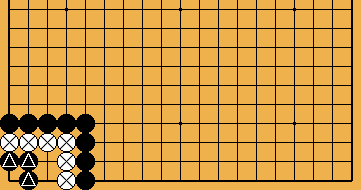 The state of a stone or a group ( ), which has only one liberty ( ; and could be captured by the next move). Very often used for the move itself - which takes the last but one liberty ( ). 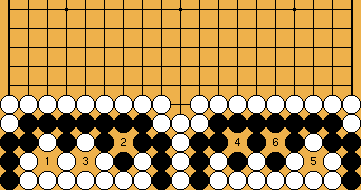 The shape of the four black stones after Black played . It is normally impossible to cut through this strong connection. 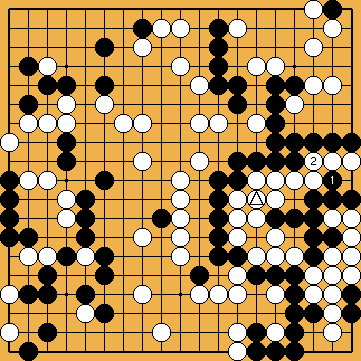 A move that separates opponent's groups ( ) in conjunction with an own, diagonal adjacent, stone ( ). Two ko, happening simultaneously in the same fight, and serving the same purpose. If one side captures the first ko (here with / ), the other side captures the second ko (with / ). 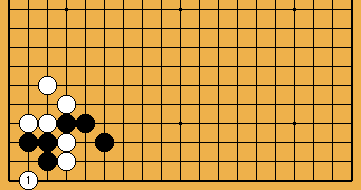 Can become a large supply of ko-threats (here for Black), if another ko on the board arises. Net. Capturing by blocking the possible exits. Netz. Fangen durch Blockade der möglichen Ausgänge. Losing the initiative. A move, which need not be answered. Good bad shape. A shape (usually an empty triangle), which looks bad, but is good, and effective, in the local context. "Flower viewing" or "Picnic" ko. 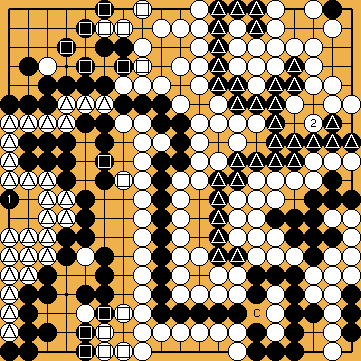 One side has almost everything to lose (or much more than the opponent), while the other stakes almost nothing. 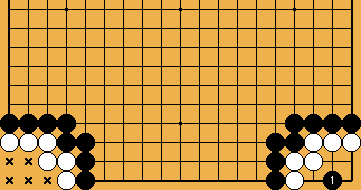 A diagonal move played from an own stone in contact with an opponent's stone. Often facing the edge of the board. 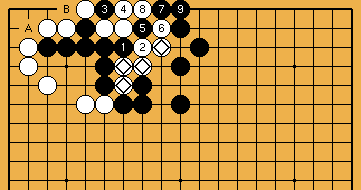 A seki ( ), in which each side has a chain in atari ( ), which must not be captured. Otherwise the loss will be greater than the gain. If the external part group of the hanezeki ( ) consists of more than one stone, this is no longer called "hane", but the "hanezeki's tail". Clamp. A move, which attaches to an opponent's stone, and at the same time, pincers that stone. Drawing back. 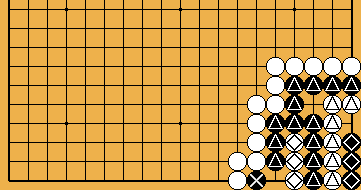 A move, which connects an endangered stone (loosely) towards own stones. Zurückziehen. Ein Zug, der einen gefährdeten Stein in Richtung eigener Steine (locker) anbindet. The game ends in a draw. Forcing move. A sente move, which often has some additional effect that might be used later. Often played outside the main flow of play. 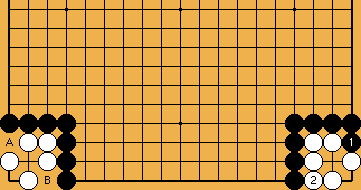 Shape, in which the rules prohibit the capture of a single stone ( ) that has just captured a single stone at the prohibited point ( ). Capturing Race, wherein one side ( ) has an eye, the other ( ) hasn't. Two options of the same value. 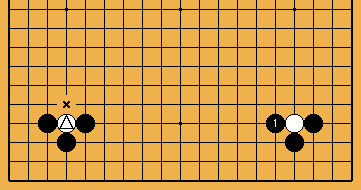 If one player takes one of them, the other one is left for the opponent (who is often forced to play there). Large shape ( ), which can be reduced to only one eye. Also used for the move that takes the vital point of such a shape ( ). Peep. A move like - in the neighbourhood of an opponent's cutting point, which cannot be successfully occupied directly - that threatens to cut with the next move. Creating of cutting points, and sacrificing of stones, to produce a shortage of liberties. 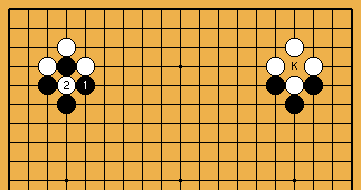 In order to save his -stones with three liberties, White must connect at four points, , , 3, and 5. Placement. 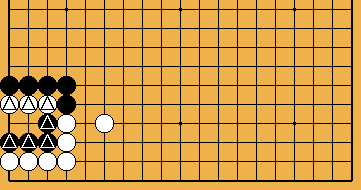 A stone placed inside an opponent's group, often on a vital point. 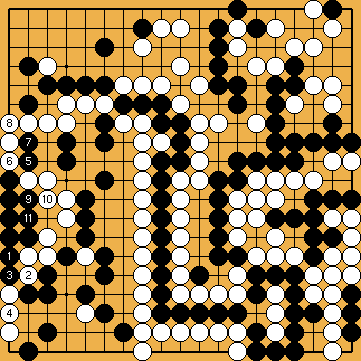 A move like , which descents towards the edge of the board. A configuration where groups of both colours share liberties, and are not independently alive. 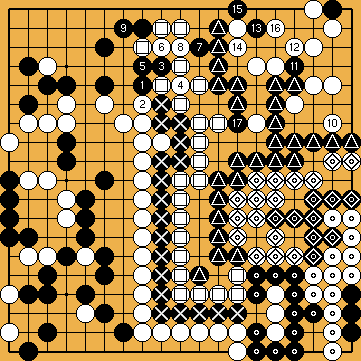 Neither side may capture any of their opponent's stones without losing more points than they gain. "Capturing Race". Fight for life and death. Initiative. A move, which is answered. Playing somewhere else. Not answering locally. A skilful move that is the best play in a local position. 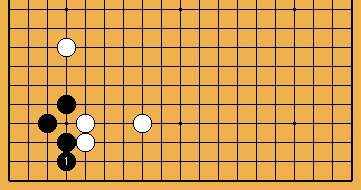 A sacrifice stone, which prevents the opponents from connecting at that point, and which results in a false eye shape ( ). Three ko, happening simultaneously in the same fight, and serving the same purpose. After the sequence from to , if neither side gives way, we reach a repetition of the original position. 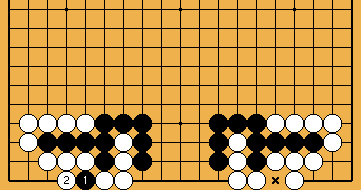 Under Japanese, and Korean, rules, the game ends with "no result". Attachment. 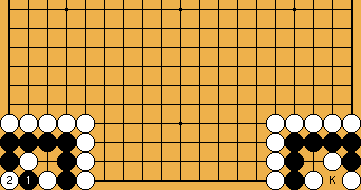 A stone which is played in immediate contact with an opponent's single stone. In this variation, after - and may be before the endgame ( / ) on the left side - White captures the -group with . Both -/ -groups will live, both White's -groups in the hanezeki will die. 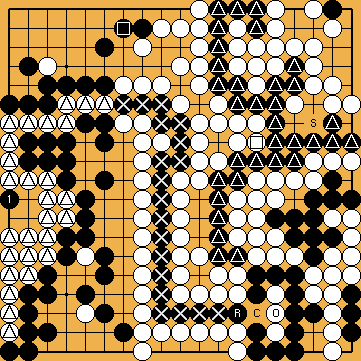 After both sides made one mistake each (Black with , and White with ), instead of following the course of our solution - just before the hanezeki's tail reached its final length - a giant seki arises in the right half of the board. We call this very special position "Circular Hanezeki". The "usual" hanezeki in the lower right corner (with , , , , and ) has become extended by Black's large group in the upper right, and White's centre group . 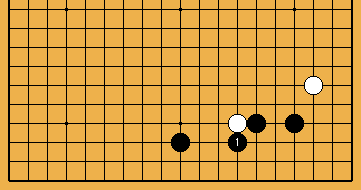 Despite Black's group has an eye, but White's group is eyeless, the proverb of "me ari me nashi" does not apply in Black's favour here - due to the characteristics of the Hanezeki involved, which stop Black from approaching White's group successfully. We call the sequence from to the "Crosscut Sequence". 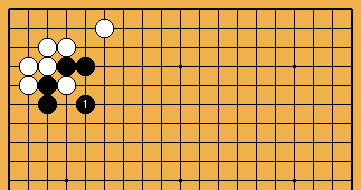 The black, and white, groups in the centre, and on the left side, are separated now. We call the sequence from to the "Hanezeki Exchange". 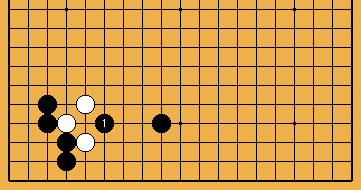 With the classical solution, it is necessary to play this exchange early in the game, because - without the second throw-in there - a move at 1 is sente for both sides. 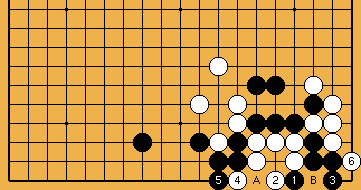 We call the sequence from to the "Hasami-Tsuke Sequence" - often applied on the moves from on only. 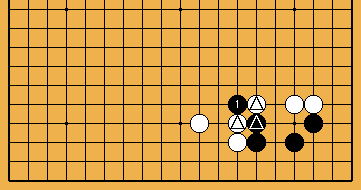 However, the hasami-tsuke of itself cannot be played without Black's push of (that White answers with the block of ) beforehand. 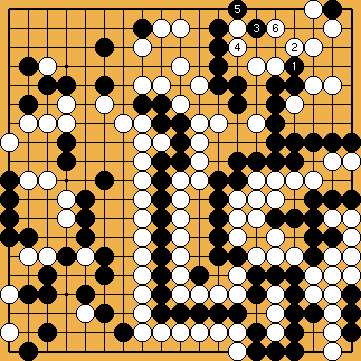 Therefore, we understand Black's kikashi of 1 as an integral part of this sequence. We call the semeai that results from the creation of the ko-shape in the upper right with the moves from to "Joachim's Ko-Semeai". This ko-semeai is preceded by the hiki of on the upper edge, found by Joachim. 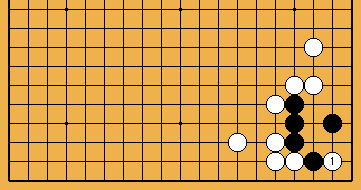 There are variations, where this move is played at instead, capturing White's left side. 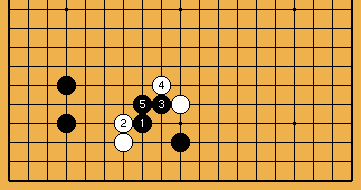 It is also feasible for Black to insert the kikashi of , during the sequence of enlarging the hanezeki's tail. We call the semeai between Black's large group in the upper right, and White's group on the left side, the "Main Semeai". Please refer also to "Semeai Variation". We call the sequence from to the "Nakade Sequence". 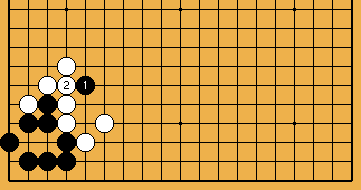 Black builds a nine-stone shape inside White's group on the left edge that will enable one eye for this group only. 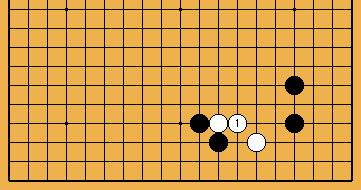 With Joachim's Ko-Semeai, we often refer to the first three move-pairs of this sequence, which generate potential ko-threats for Black that White is forced to answer in any case. If Black, mistakenly, has lost a move (for example by securing the upper left corner with ), or a liberty of his -group (White has the additional -stone now), White will - after - first capture the -group with a move at , and thereafter immediately (without playing the oki of O after Black recaptured with a move at ) continue taking the liberties of Black's -group - e.g. with a move at - which will now die. White wins the game with ease. "Punishment Semeai Liberty Level" is the minimum number of liberties of Black's large -group in the upper right ( ) that pre-empts White from capturing this group unconditionally by using the Punishment Semeai, explained above, which starts with a white move at . In the main line of our solution, the Punishment Semeai Liberty Level is seven. 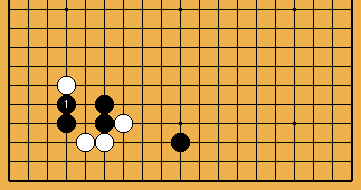 White is unable to capture both the hanezeki's tail , and Black's -group. 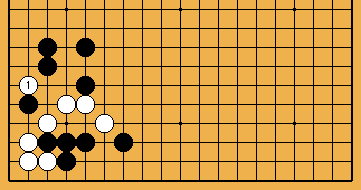 After Black plays at into the eye of the -group, with White takes - may be before the endgame ( / ) on the left side - a further liberty of the -group. 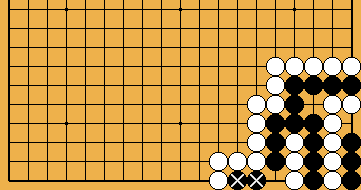 Black has to connect the hanezeki's tail with a move at . Both -/ -groups die.